Alan Watts, writing about the aims of what he calls, ‘therapeutic learning’, points to two key factors: “First, the transformation of the inner feeling of one’s own existence; and second, the release of the individual from forms of conditioning imposed upon him by social institutions.” This doesn’t seem very far from the Buddhist aspiration of awakening and realising our Buddha nature. The seventeenth-century Rinzai Zen master, Bankei, (1622-93, also known as Kokushi) centres his teaching on what had been for centuries a key Buddhist term in Japan, Fu-sho, ‘the Unborn’, or Buddha-mind or Buddha-nature: that which is ‘intrinsic, original and uncreated’. Bankei tells us that to be truly alive we need only recognise with all of our being that we are truly alive. The state of enlightenment, liberation or peace that human beings so frantically crave, is only to be realised by letting-go of the craving – which is built on illusion and misunderstanding. Similarly creativity, which is a manifestation of being truly alive, is not something that needs to be learnt or added to our being, rather it is a way of being that is most immediate and ready-at-hand, often realised by unlearning, unknowing, letting-go. Paradoxically, the process of realising by letting-go may require a very systematic discipline: for instance, the disciplines of the koan and of intensive periods of meditation – or, in an art context, the discipline of drawing a human being or a stone over and over again in order to see the human being or stone as if for the first time – what Lawrence Weschler refers to with the phrase, ‘seeing is forgetting the name of the thing one sees’. 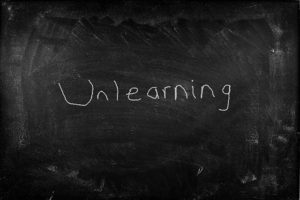 Within the arts and in Buddhist practice the need to cast off old assumptions, habits and knowledge, to ‘unlearn’, is often as important as learning. This shedding of a skin can be a powerful and transformative process, leading to a sense of renewal and empowerment. The practice of mindful meditation can be seen as a process of paying close attention to all that arises in our embodied mind, without adding a commentary or making judgments, and without clinging to experiences as they flow through us. Letting-go becomes a key strategy in changing our relationship to experiences and to the world. Through non-attached attention we dissolve the chains of reaction and habit that have built up over the years, enabling us to see things as they are, rather than as we would wish them to be. We learn new ways of being by letting-go of old ways. By unlearning and unknowing we dissolve the rigid boundaries and responses of our acquisitive ego-self and discover a more fluid and open identity that is in closer harmony with how the world is. Too often learning is seen as a process of increasing knowledge, an acquisitive, incremental process of adding to our storehouse of information, conceptions and habitual responses. Instead learning can be seen as a transformative process in which letting-go is as important, or possibly more important, than holding on – indeed real learning, involving meaningful change and insight, can be hindered by our accumulated ‘knowledge’. Our preconceptions, habits of thought and acquired information can prevent us from realising through experience. This experiential mode of knowing requires a constant willingness to give up as well as to gather – to unlearn in order to learn afresh.